If what we eat and drink keeps us alive, then we must be careful of what we eat and drink, because the same that keeps us alive can bring death to our life, as there are so many of us who do not know the kind of food and drink that we should eat and drink for long life. Living under the guidance of the enemy of right and the God of the unrighteous is a very dangerous position to be in. This is just the position you and I, the poor, righteous so-called Negroes (lost-found members of the aboriginal Black Nation), are living in. 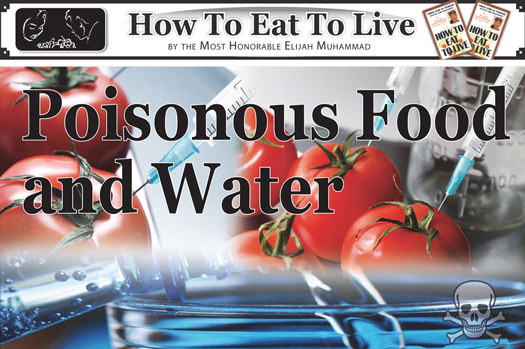 Poisonous food and water we are now eating and drinking—sometimes too much poison to kill poison that is in our food and drinks. And, maybe it is the wrong poison for us human beings, whether it is in food or in drinks. Take, for instance, the use of fluoride, chloride, and sodium, which if not used correctly can destroy our entire life. Maybe it is best to find something else that will clear our water without killing both us and the poison in our food and water. The scientist should not advocate the use of such poisonous chemicals as fluoride, chloride, and sodium, which may have a bad effect on our brains and our human reproductive organs. The scientist that uses such poison on human beings wants to either minimize the birth rates or cause the extinction of a people. D.D.T., which is sprayed on food while it is growing up from the earth, is also a poison that should not be put into the human body, regardless of the desire to kill the insects, that loves to dine on the same food on which we dine. The poison may not take instant affect on us, as it does the insects, but it can, over the long years, help shorten the span of our lives. We live in a world commercializing on everything where money is involved, and this has speeded production of everything but human lives, in order to fill the demand of the people. This has caused many scientists to overlook the dangerous effects that such fast production has on the health of the people. Therefore, the only way out for us, the poor Lost-Found, is to seek refuge and guidance in Allah for our protection from evil planning’s and doings of Satan. Allah (God) has pointed out to us in both the Bible and the Holy Qur’an that right foods for us to eat and He has pointed out the poisonous food and drinks. Follow His guidance or suffer the consequences. Do not eat the swine—do not even touch it. Just stop eating the swine flesh and your life will be expanded. Stay off that grandmother’s old fashioned corn bread and black-eyed peas, and those quick 15 minute biscuits made with baking powder. Put yeast in your bread and let it sour and rise and then bake it. Eat and drink to live, not to die.